Eliminate Valvetrain Flex and Parts Breakage with Moroso's Single-Bar and Double-Bar Stud Girdles. These Moroso Stud Girdles provide high-rpm valvetrain stability for stud-mounted rockers - a necessity with high lift cams and high pressure valve springs. Designed to eliminate rocker stud flexing, power loss. Dyno testing shows a 7 to 22 horsepower gain. 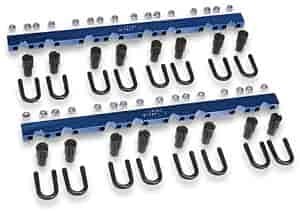 Feature a sturdy aluminum bar and special heat-treated U-bolts to reinforce the rocker stud, providing a positive way to lock the valve lash adjusting nuts. Includes all adjusting nuts and hardware. Provide more holding power and reinforcement using extremely high-pressure valve springs. When used with Moroso Hex Head Adjusting Nuts, valve adjustments on a Small Block Chevy and Big Block Chevy can be made with one 9/16" wrench and requires loosening only one bolt to adjust each pair of rocker arms.